Discussion in 'Motors' started by dale1uk, Dec 16, 2018. I've been out in it a few times now and what a machine. The way it puts it's power down and the sound on overrun is just intoxicating. I've no idea how's he's going to top this on his next trip home! Must cost him a bit to keep doing this, but fair play to him here. Much win! And as we know, hire cars are faster than non-hire cars and are indestructible. Should be fun. Depending on how favourable he is with the hire company expect to pay around £2500-£5000 per week, miles depending of course. It is also probably something I shall do before dropping 100k on the next car is hire the potential candidates for a couple of days if test drives are lacking. Did you just make that up? Nobody is paying 10 grand to rent an Audi for 2 weeks. Black wheels.... yuck!! Love the R8 though. Technically he could still be right (sort of) - you don't always pay 5x or 7x the cost of 1 day hire if you book whole blocks at once - we recently hired a vehicle for 7 days that was £100 less than 7x the daily price. 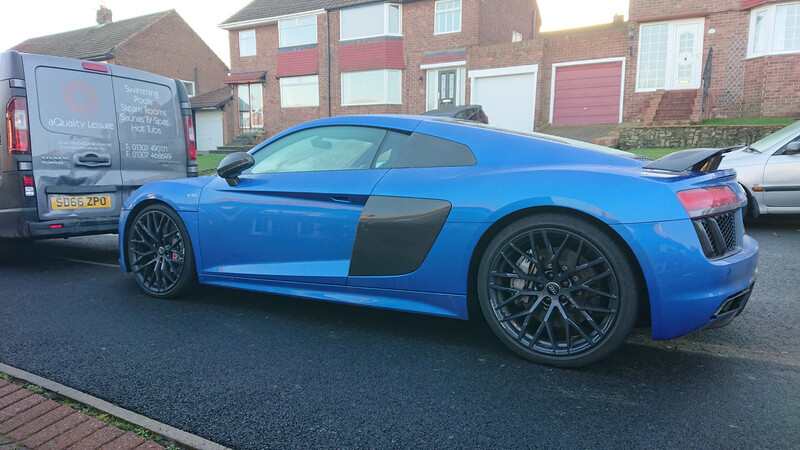 EDIT: Infact straight up googling the R8 hire you can find that car at a starting rate of just over £700 a day where the daily price drops if you book in 3 day blocks and if you book 8+ days at a time you get another £100 per day off the daily rate (1 week hire is around £3.5K for the exact car in the first post). Surprised its so close to lower end of what I said, seems quite the bargain really. That (exact) car in the first post per week is pretty much smack in the middle of your range at approx. £3500 from the first two hits I found on google. R8 V10 not really on my list for next car but at a couple of grand think I shall just take one for a week and get it out of my system. Surprised how cheap, but I've been admittedly looking at 570S, GT3 and 458 rent values which are typically £1200-£1500 per day, if anyone knows cheaper please let me know. I am going LA and Vegas in January and supercar hire is typically a lot cheaper there so will probably get something nice whilst there also. Hopefully before the exchange rate goes too meh. Definitely worth doing - my brother in law hired some nice stuff out there on his honeymoon in Florida for way under what it would cost here. The rate is already meh, its been poor for ages but yeah in last month its dropped from 1.30 and now to 1.25, now cost more for stuff in pounds than it does USD due to VAT.